Brown is rich, warm and solid. It is of the earth. Natural and strong. A sign of age. Wild and grounding. Both rustic and luxe, rough and minky. It is aged and experienced. No matter the personality or incarnation, brown is familiar. November feels very brown. The leaves. Log stacks. Vegetables roasted to a golden brown. Anything caramelized. Hot tea, coffee, and cocoa...in other words, liquid brown. Tawny vintage boots. We'll be peppering our blog all month long with this color. A glimpse of an Edward Shae, dining room. Interior designer Morgan Martin explains what she was going for. "The vision was to make it feel like a Southern smoking room, elegant with ease. Functional for family meals while still fun and unexpected." 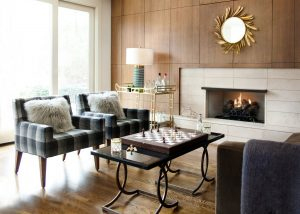 Modern wood paneling as spied in one of Currey & Company's chic look books makes a perfect backdrop for the Folium mirror. This room could be from the 60's or it could have been installed last week. 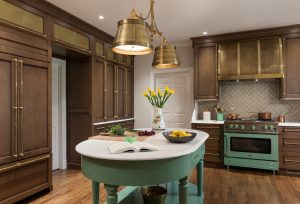 A kitchen designed by Caryn Cramer in which cabinets were treated to an antique wash over stain. Caryn says, "I love how it allowed the cabinets to appear older. It's also nice when a wash like that gathers and pools slightly differently in crevices. Adds character." Handsome impostors. 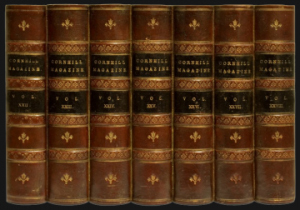 Original Book Works leather book panels -- hand-painted and customizable -- add antiquarian style to a space. They make a room look smart. 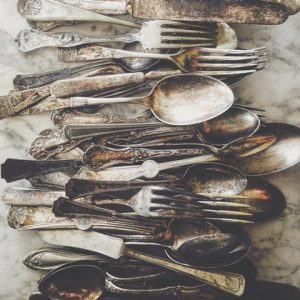 This tarnished trove of vintage flatware from the Patina Vie blog. Founder Sarah Willett welcomed this stash into her white winter kitchen. The vintage obsessed creative is "ever charmed by warm layers of time." And the 6-legged Greek Key-motif console image at the very top of this blog is from Scarborough House. We're obsessed and love company!